A couple weeks ago I briefly mentioned the issue of ghostly Google book scanners’ hands appearing in digitized versions of Google’s books. I think this is a great opportunity to delve further into a complex example of content and container merging, or perhaps more appropriately, colliding. In this case, Google’s attempts to seamlessly reproduce, for free, ‘the most comprehensive index of full-text books’ is being disrupted, and in quite revealing ways. Reactions to the hands have been fascinating – they have been called ‘disturbing’, ‘creepy’, and ‘eery’ (Goldsmith, 2013; Marshall, 2014). Some have felt that the hot pink ‘finger condoms’ are the most jarring aspect of the images (Moore, 2009). There is a feeling of disembodiment here – one blogger, Phil Patton, likened finding the hand obscuring the page with disgust: “The suddenness of its appearance suggested scanning as an unclean process; I thought with horror of the guy who found a finger in his bowl of fast food chili.” (in Moore, 2009). This notion of ‘cleanliness’, or the assumed mechanized process of digitizing books, shows another side to these reactions – they inadvertently reveal much about public opinion regarding the digitization of books and issues of authenticity. A BuzzFeed article titled “21 Google Book Scans That Bring Surprising Intimacy To The Digital Book World” hints at the obfuscation of the very human work that goes into digitization projects (human, and therefore, prone to error). The sheer volume of books being scanned has been to blame for the many “glitches, not least the scattering of pink fingers” (Moore, 2009). One Wired article reproduced a photo of a worker’s hand with the caption, “Overworking your book-scanning crew much, Google?” (Beschizza, 2007). Another blog coined the phenomenon as ‘finger spam’ and “called on Google to ensure its scanning is more reliable if it wants to make money from on-demand publishing” (Moore, 2009). Whitney Anne Trettien has pointed out of annotations in print-on-demand books that, “the history promised by this POD facsimile remains inaccessible, its ostensibly transparent textuality obscured through the process of digitization. Multiple scans have deformed its turn-of-the-century typography; the open system of earlier annotations — an invitation to discourse with the page, and with the past — has hardened to a pixelated crust. Rather than humanizing the book for its readers, then, these fixed annotations render it more alien, since they never allow it to transcend its own objectness, to dissolve into the immediacy of text” (2013, par. 23). Kenneth Goldsmith points out that, “Something new is happening here that brings together widespread nostalgia for paperbound books with our concerns about mass digitization,” he feels that “the obsession with digital errors in Google Books arises from the sense that these mistakes are permanent, on the record” (2013). If we look deeper though, past initial feelings of affront, there is something insidiously revealed by the presence of these hands; they make manifest the otherwise invisible labour of Google book scanners. Goldsmith writes that, “it’s easy to forget that they’re the work of an army of invisible laborers—the Google hands” (2013). Most importantly, these hands speak to issues of class and race within Google’s labour practices. Leah Henrickson has noted, “Once you start looking at pictures of Google book-scanners’ hands, you’re bound to (pretty quickly) recognize a trend: most of these book-scanners seem to be people of colour. Women of colour, in particular” (2014). Avi Solomon has noted that, “If you search Google Images for ‘Google books fingers’ you get poignant images (to my lights) of scanner worker bee hands. Makes me value the massive, anonymous and underpaid effort that goes into maintaining the ‘digital’ economy” (in Frauenfelder, 2009). In 2007, Andrew Norman Wilson, an ex-contractor of Google, while working at the Google campus, decided to learn more about Google’s data-entry workers, or ‘ScanOps’, those responsible for the digitization of these books. He captured some footage of the workers leaving their shifts, and was fired for issues of privacy shortly after. His video has become an art installation called “Workers Leaving the Googleplex” (see here: https://vimeo.com/15852288), a play on the Lumière Brothers’ 1895 “Workers Leaving the Factory” (Goldsmith, 2013). In addition Wilson has created a larger art project entitled “ScanOps” (http://www.andrewnormanwilson.com/ScanOps.html), which has been displayed in galleries, featuring “large, saturated color photos of those same workers’ hands” (Goldsmith, 2013). His efforts also remind us that “we, too, are contributing our own labor to the company’s bottom line” (Goldsmith, 2013). While true, in some ways, the transformation of these hands into art objects further objectifies them as something of note – and who is profiting from that? 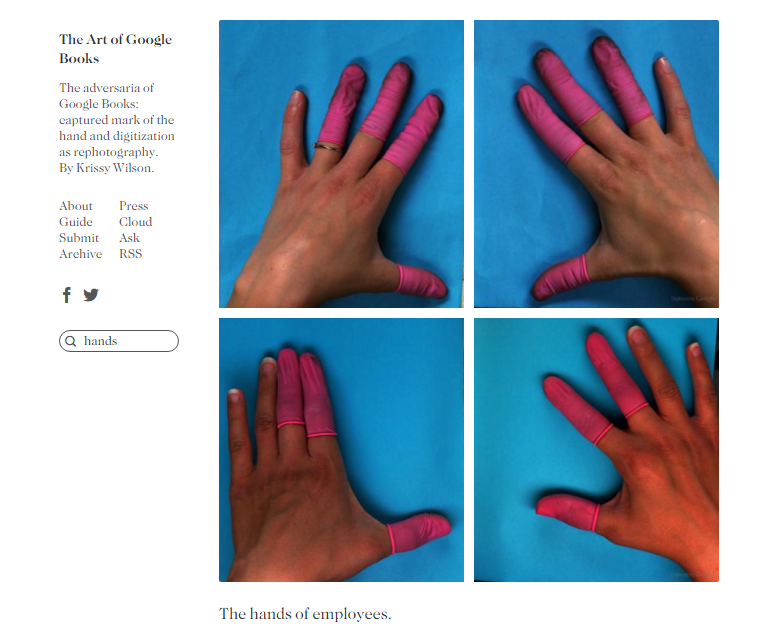 Wilson is not the only one to undertake artistic endeavours related to these hands – artist Benjamin Shaykin has published a book called “Google Hands” (http://benjaminshaykin.com/Google-Hands) that also reproduces the images. Krissy Wilson, creator of the blog “The Art of Google Books” (http://theartofgooglebooks.tumblr.com/) has noted that “The Art of Google Books can serve as a tool for people that digitize books, explicating much of what can go wrong in the photographic process, as well as standing alone as a gallery of aesthetic images” (in Fleischer, 2012). This is a rich topic, one that I would like to explore more in depth than I have a chance to here (maybe I’ll be rerouting my final paper topic?! ), that has much to tell us about beliefs of the sanctity of physical books, the so-called ‘flawless’, mechanized process of digitization, and the very real human beings that hold, manipulate, work, and (sometimes, if just by accident) reveal themselves, superimpose, obscure, and comment on the material they reproduce. Beschizza, Rob. (2007). Google books adds workers’ hands to classics. Wired. http://www.wired.com/2007/12/google-books-ad/. Fleischer, Victoria. (2012). Q&A: The art of Google books. http://www.pbs.org/newshour/art/qa-the-art-of-google-books/. Frauenfelder, Mark. (2009). 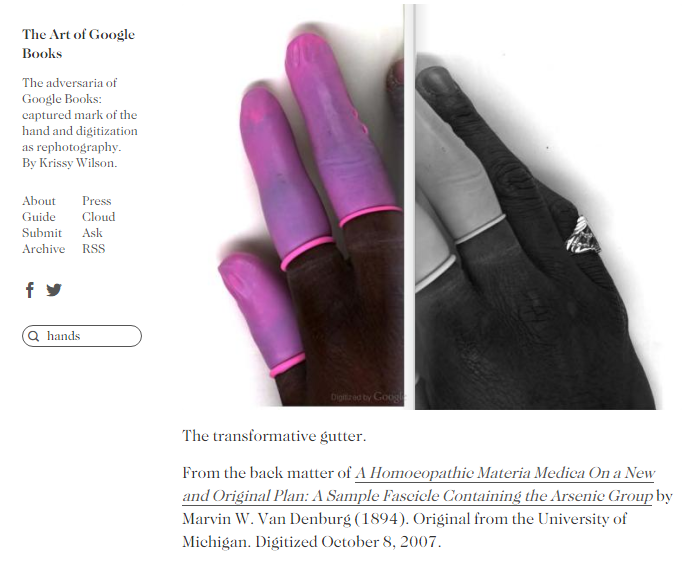 Scans of google books with fingers in them. Boingboing. http://boingboing.net/2009/10/22/scans-of-google-book.html. Henrickson, Leah. (2014). The darker side of digitization. Book History, Illuminated. https://bhilluminated.wordpress.com/2014/03/20/google-book-scanners/. Marshall, Chelsea. (2014). 21 Google book scans that bring surprising intimacy to the digital book world. BuzzFeed. http://www.buzzfeed.com/chelseamarshall/google-book-scans-than-bring-surprising-intimacy-to-the-d#.rrB1brmDp. Moore, Matthew. (2009). Google book ‘finger condoms’ cause mirth. The Telegraph. http://www.telegraph.co.uk/technology/google/6396896/Google-Book-finger-condoms-cause-mirth.html. Trettien, Whitney Anne. (2013). A deep history of electronic textuality: The case of English reprints Jhon Milton Areopagitica. Digital Humanities Quarterly (7) 1. http://www.digitalhumanities.org/dhq/vol/7/1/000150/000150.html. Wilson, Andrew Norman. (2011). Workers leaving the Googleplex. https://vimeo.com/15852288. Wilson, Krissy. The art of Google books. http://theartofgooglebooks.tumblr.com/. This is a really interesting topic. In this information age we take for granted that there is actual physical labour going into the conveniences that we all enjoy. When I see topics like this I wonder why they are not the focus instead of arguing over issues like immaterial labour. Things like free labour tell us very little about the struggles of workers in media markets and crises they face. If you’re interested in things like class struggle, Professor Brett Caraway (from UofT Mississauga) has some articles about it). Thanks for your comment! I absolutely agree that this is so deeply taken for granted – and in some ways – if Google is doing their job ‘right’, the point is for the labour to be made invisible. I appreciate the suggestion, I will definitely check out Prof. Caraway’s work! This is a really interesting exploration of first, the human interruption of the digital, and secondly what that interruption represents/means when these types of mistakes take on negative connotations in conjunction with considerations of the people who are doing this labour. Here the container is really the human, and specifically an overworked, underrepresented, marginalized human. I had to go back and watch the Lumiere film before watching “Worker’s Leaving the Googleplex,” and it was again a fascinating juxtaposition, with many of the workers being women in both instances. In an increasingly industrialized society, thinking about how these divisions of labour affect our relationship to the information we are consuming is key, because it is one way we actively suppress the container’s relationship to it’s content. This seems to be especially prevalent in digitization projects where the desire to make everything clean, efficient and streamlined, forces the reader into an environment that privileges content and asks them to ignore the layers of form that are at work within the information. I think you make such an interesting point, describing the ‘container as the human’ – even more so when you consider that in this case humans literally hold the content of the book that is being digitized, sort of like a glass holds water – a container in its true sense. I’m so glad you checked out the videos! I too agree with (and am troubled by) the idea that digitization projects strive towards this ‘cleanliness’ i.e. not marked by the human, or by error, and what this erasure means – like you say, what the reader is asked to ‘ignore’ beneath the surface. The more that the world around us becomes streamlined, it seems as if we have to work harder and harder to keep finding Oz behind the curtain, and see what’s really at play.